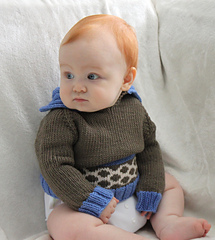 Contrasting ribbing and a simple, sweet colorwork design set this sweater apart! 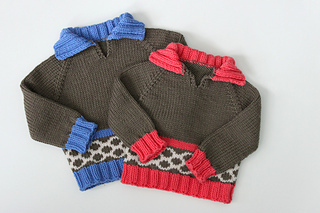 Choose gender neutral shades or a pop of pink or blue for that special baby. 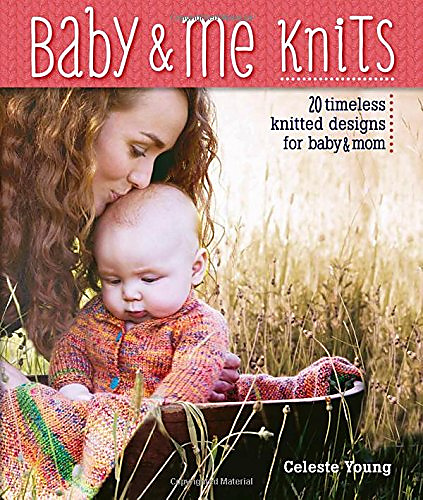 The top down design is easy to knit and can be tried on your baby as you go to ensure a perfect fit. Finished Sizes: 3 (6, 12, 18, 24) months. Peach sample shown is size 12 months, modeled on an 18 pound baby; blue sample shown is size 18 months, modeled on a 24 pound baby. Yarn: Cascade Longwood (100% Superwash Extrafine Merino; 191 yd 175 m/100 g): #11 Walnut (MC), 1 (1, 1, 2, 2) hanks; #05 Peach OR #22 Sky Blue (CC1), 1 hank; #01 White (CC2), 1 hank.